The Royal Engineers Association promotes and supports the Corps of Royal Engineers among members by fostering a spirit of comradeship and service, and by maintaining an awareness of Corps traditions. The Association also acts as a link between serving and retired members and provides financial and other assistance to serving and former members, their spouses, widows and dependents who are in need. 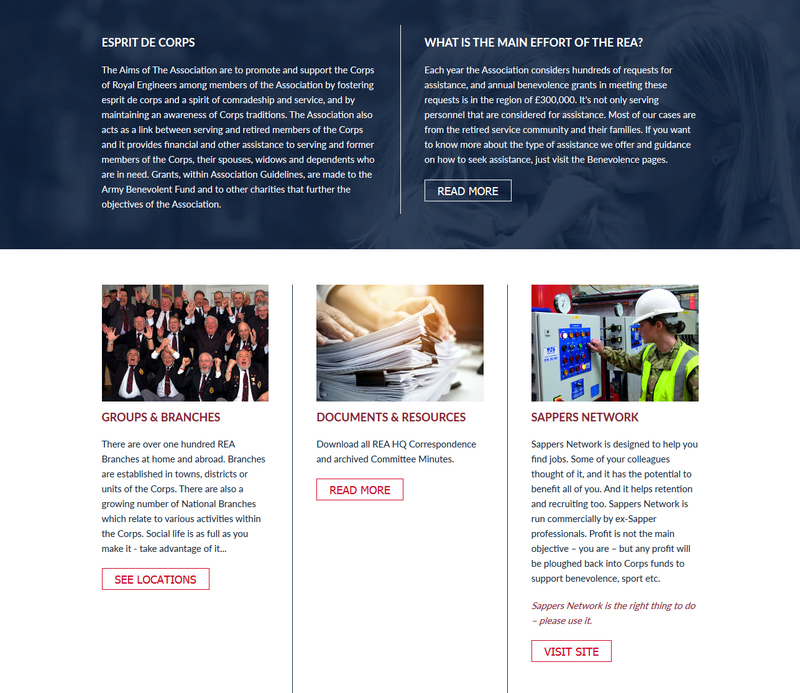 We had previously designed a logo and website for Sappers Network; “an online employment support service and network for Corps’ Service Leavers, Reserves and Veterans”. We were then approached by the Royal Engineers Association to design a new logo and website as the existing site had been designed around 10 years ago. We want them to feel that we are up-to-date. That we are able to offer something entertaining. 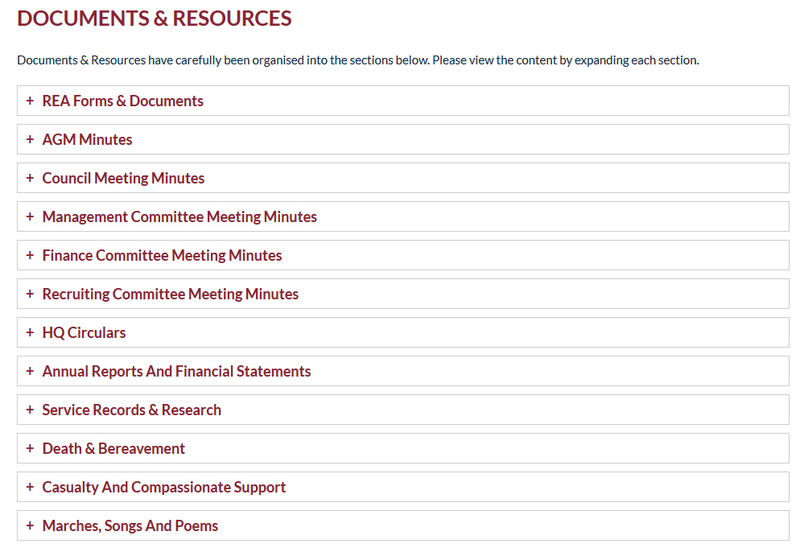 That we are not a dull old-fashioned organization. The new logo incorporates the existing Royal Engineers crest and also the official stripes of the corps. An exact ratio for the stripes was specified by the client plus Pantone colours were matched. The font (Helvetica) was taken directly from the existing crest to maintain conformity. We decided to create a clean and simple website with a long home page. The site was colour coded to match the REA logo with main sections incorporating red and blue with duotone background images. Smaller sections such as news and events were aligned to a 3 column grid to break up the site. ‘Join us’ and donate call to actions are also prevalent throughout. A banner image showing both retired and serving troops was chosen from existing photography. It has an informal nature and helps convey the diversity of the Royal Engineers Association. 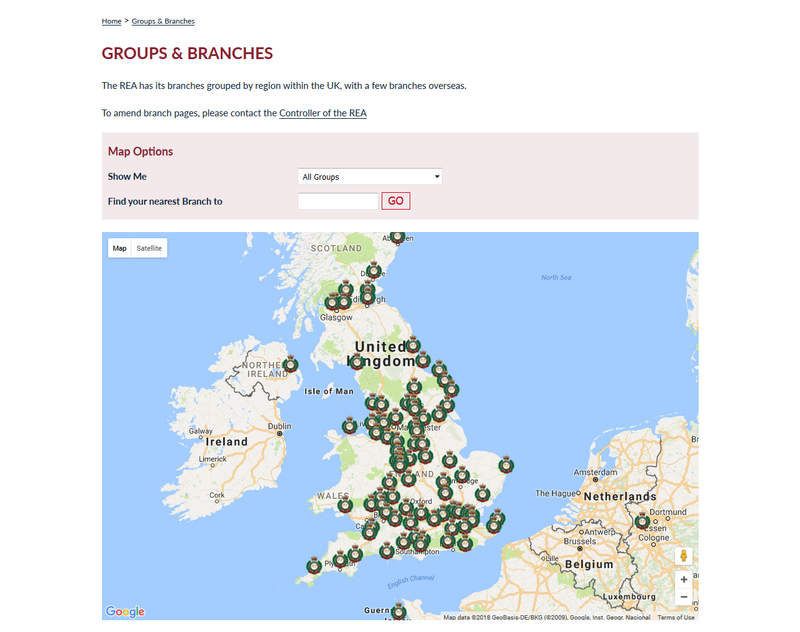 Google maps integration was a major feature incorporated into the groups and branches section plus a handy postcode feature has been added to make the user experience as simple as possible. 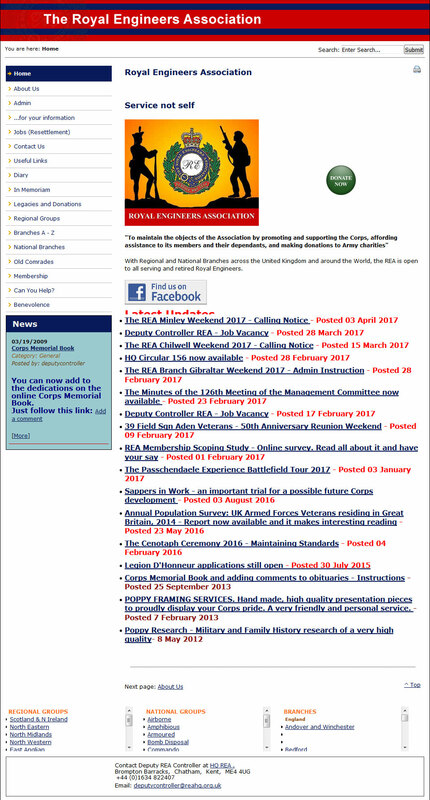 The site also features a large documents and resources section, a notice board for contacting old comrades and a memorial section. With more and users accessing the site via mobile & tablet and given the large number of documents available on the site it was crucial that a simple to use interface was chosen to access and download documents. With this in mind all the documents were organised into collapsible sections.